Hyperhidrosis, hyper (too much) hidrosis (sweating), is a medical condition that causes abnormal or excessive sweating and perspiration of the body. This condition can be generalized for specific to certain parts of the body such as hands, feet, armpits and other areas of the body. 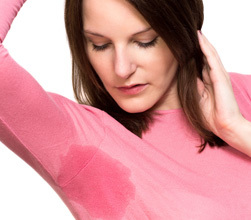 Many people who have hyperhidrosis sweat from one or two areas of the body. Most often, they sweat from their palms, feet, underarms, or head. While the rest of the body remains dry, one or two areas may drip with sweat. This excessive sweating can interfere with everyday activities. Hands can be so sweaty that it becomes difficult to turn a doorknob or use a computer. Sweat from the underarms often soaks through clothes, causing obvious sweat marks. Because the skin is often wet, skin infections can develop. Heavy sweating or hyperhidrosis can be an extremely embarrassing problem, but there are some effective ways to treat it. At Summerskye MD, we offer the latest treatment procedures to eliminate the issue of excessive sweating or hyperhidrosis. Sweating is natural since we sweat to help the body stay cool to prevent us from overheating. People sweat more in warm temperatures, when they exercise, or in response to situations that make them nervous, angry, embarrassed, or afraid. People with hyperhidrosis appear to have overactive sweat glands. They sweat when the body does not even need cooling, which is unnatural. The uncontrollable sweating can lead to significant discomfort, both physical and emotional. The use of Botox injections for the treatment of excessive underarm sweating is a recent development that has revolutionized the medical treatment of excessive sweating. The use of Botox to inactivate the sweat glands has rapidly become one of the most commonly used treatment remedies since being FDA approved in 2001. Botox completely stops sweating in the area where it is placed by blocking the release of acetylcholine ­ a hormone which is responsible for activating the sweat gland. When acetylcholine is blocked, the sweat gland becomes inactive. Botox is applied locally, resulting in no widespread side effects. It works for almost everyone. Each twenty­minute injection session can stop sweating for six to twelve months. For most people, this therapy is a delightful change, liberating them from daily worries of sweating in the wrong place at the wrong time. The procedure can be done with minimal pain, and patients can resume their normal activities immediately after the procedure.